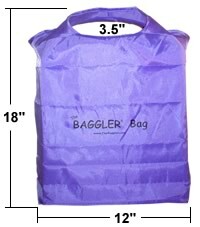 BAGGLER Bags are a very convenient and logical alternative to plastic bags & bulky reusable shopping bags. Strong & Durable: BAGGLER Bags are designed to last and withstand the rigors of most shopping activities. Constructed of 210T non-woven fabric combined excellent workmanship each bag is capable of carrying 14 lbs. Reusable & Eco-friendly: These bags are meant to be used again and again. Using BAGGLER Bags will help reduce the proliferation of plastic bags and help save our environment. Ergonomic Handles: Our unique design makes these bags are easy to carry. The handles lay nearly flat in your fingers and they won't pinch your fingers and wrists. For heavier loads and multiple bags you can always use The BAGGLER® carry handle which makes carrying bags even easier and more comfortable. Washable & Sanitary: These bags are simple to care for. They are made of fabric that is easy to wash and quick to dry. You will feel safe using these bags to carry fresh produce and meats. Get rid of unwanted dirt, mildew and stains from items that spilled or dripped into your bags. Wash contaminating detergent scents from previous use. You always want clean bags to carry your new purchases and important belongings. Light weight: Each bag weighs only 1.2 ounces. 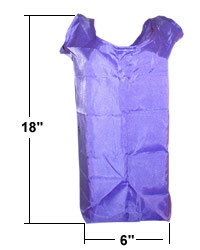 Perfect Size: Large enough to carry 3 large bottles of soda, these bags hold the right amount for most people to manage. BAGGLER Bag dimensions are 18"H (including 3.5" handles) x 12" W with a 6" gusset. The bag is tall but the handles are short which means you can fit more inside the bag and still carry easily. These bags are not so long that you drag them on the ground. Stylish & Attractive: In addition to the fabulous colors, your BAGGLER® Bag Bag is a neat and stylish pouch that can be easily attached to your pocketbook or fits in your coat pocket. You'll like the alternative to walking into the store with your bags neatly stowed away in this pouch versus entering the store or mall with a bunch of bulky shopping bags tucked under your arm. Compact & Convenient: Rolled up or folded up easily / occupying very little space. The Velcro strap keeps the bags rolled up and easy to put away. 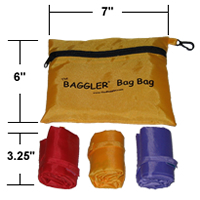 Several BAGGLER Bags fit easily in The BAGGLER® Bag Bag / zipper pouch. When you have unloaded your bags you can pack them away in the neat pouch. The entire package fits in a pocket, pocketbook or console of a vehicle. Using BAGGLER Bags frees you from having to carry bulky clumsy & awkward shopping bags. Strong and Durable: The BAGGLER® is built to last and be used over and over again. The base handle of The BAGGLER® is made of a very strong plastic copolymer that perform in a wide range of weather conditions, hot, cold, rain, and snow. The BAGGLER® is made with materials that can withstand some of the coldest temperatures, as low as 5 degrees below zero and scorching heat as hot as 120 above. Capable: The BAGGLER® has three solid hooks that can hold up to 18 lbs each. 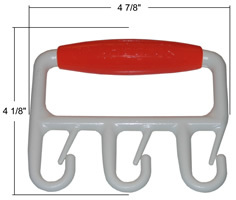 Each hook can hold several thin handle cloth, rope handle and plastic shopping bags. Placing multiple bags on each hook of The BAGGLER® means that you could carry many bags with a maximum weight slightly greater than 50 lbs. The Perfect Size: The BAGGLER® is not too big and not small. It's the perfect size, about 5" wide x 4.5 " height and less than 1/2 inch thick, except the handle grip which is 7/8 inch diameter. The BAGGLER® only weighs 1.7 ounces. Wow! The BAGGLER® can fit into your pocket, your purse, pocketbook or knapsack, glove box, or easily clip onto your belt loop. Easy to use: The BAGGLER® is designed to slide your thin handle cloth, rope handle and plastic shopping bags on and off with the least amount of effort. There a two major components that contribute to the remarkable ease in which plastic bags slide on and off. First, The BAGGLER® is made of a copolymer that is smooth, almost frictionless, and latex free. The copolymer has tremendous memory and the tines and hooks retain their position, but have enough flexibility to allow almost all plastic bags to slide on and off. Second, the precise design of the hooks and tines keeps your plastic bags from getting snagged. A slight overlap of 3/16" and a smooth rounded tip that creates a "V" like channel that will allow you to remove each bag handle easily. You don't have to move the tines, they are flexible enough to allow the bag handles to slide through and off the hooks. Comfortable and pain free to hold onto: The BAGGLER® grip is made of a soft rubber type composite material. The grip is comfortable to hold for long periods of time. It is ideal for those that have to carry bags home, or if you plan on going from one store to another while shopping in the mall. Do away with the agony and discomfort you experience with holding those thin handle cloth, rope handle and plastic shopping bags that cut into your hand and fingers. Convenient: The BAGGLER® gets rid of the hassle that is commonly experienced by those that use plastic bags to carry items. The hooks and tines keep the handles of the bags from coming apart and will prevent items from falling out of the bags each time you set your bags down on the ground to rest or open a door, Items stay inside the bags while your driving you vehicle. Attach the bags to the hooks while they are still in the grocery cart. Lift and place in the back seat or trunk. And when you are ready to carry the bags again, all of your bags are attached to the hooks. No need to search for each of the plastic bags handles or put things back into the bags. Just grab The BAGGLER®, No more hassle! Check out our new items that will also Make Life Better: Spray Around and Super Rope Cinch!